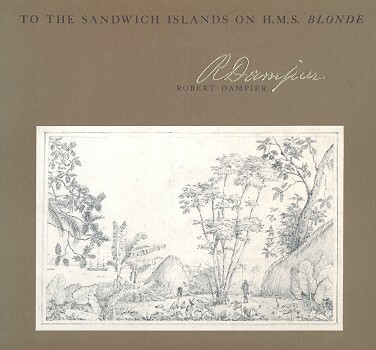 Robert Dampier : Sandwich Islands, 1825. H.M.S. Blonde sights Hilo, Hawaii. About this time, we perceived three canoes busily employed in fishing. As we speedily came up with them, they hauled in their lines, and being hailed by one of their Chiefs in their native tongue,- the foremost in which were three men, paddled towards the ship. ... barbarous appearance of her almost naked countrymen, retired to her cabin. This delicate Lady, a few months since, was Just as much disencumbered of her cloathes as the savages before her. Her fame, as being the best swimmer, and one, who would go thro' a heavy surf, before any of her less daring Companions, is universally acknowledged. Perhaps, this assumption of Modesty was put on to suit our English ideas, and her present civilized situation. The Master of the Frigate, together with Mr. Malden the Surveyor, being dispatched in two different Boats, to ascertain the exact sounding, and what depth of water existed nearer the shore, the Ship lay to, about six miles from the land until their return. In the mean time, several canoes came paddling around us, in order that the Natives might gratify their curiosity, with the nearer view of a ship, the largest that had ever appeared on this coast. Some of these Canoes were beautifully constructed, and capable of carrying six or eight men. They are long, and uncommonly narrow, barely allowing sufficient room for the body of a man to introduce itself between the sides. ... to the rules of architecture, truly surprising. Each canoe has two large poles about half its length, their ends sloping downwards proceeding from the gunnel, in a horizontal direction; to these, is firmly lashed another pole, of the same dimensions, its extremities curved upwards, which is lashed, in a parallel direction with the canoe like the fishing boats of Ceylon. This piece of simple machinery, prevents the canoe from upsetting, which disaster, considering how narrow they are, would but for this contrivance, be continually taking place. Their Sail, which is a triangular Mat, is neatly rolled up upon this outrigger. The royal furnerals to take place on 11th May 1825. Kahumanu having a very good wooden house, which had lately been brought from America, begged Lord Byron to take possession of it during his stay at Woahoo: On the 18th of May he became a resident there, and having invited myself, the Surgeon, Chaplain & Naturalist, to live with him, we passed our time very agreeably. We were amply provided with the greatest delicacies the island produced. Boki took care our Cuisine should be always well furnished; Marini the old Spaniard was ordered to supply us with new milk, butter and fruit, such as Grapes, Melons, Bananas, &c., and having our own cook and servants on Shore, we fared sumptuously every day. They begin now to understand the value of money, and are no longer willing to barter for beads or insignificant trinkets. We constantly had plenty of traffickers about the house of the old Queen, bringing Idols, Shells, Stone axes, and other Curiosities, for which they invariably demanded a dollar. Observing that several of us were eager to possess some of these ancient Idols they diligently set to work, and soon fabricated a great number of grim looking deities. To these they endeavoured to give as ancient a look as possible hoping thus cunningly to impose upon our credulity. They evince great ingenuity in various mechanical arts. Their canoes are uncommonly well constructed. Formerly a stone axe was the only instrument employed in chiselling them out. They at present make use of the English adze which considerably facilitates the operation of hollowing their canoes. They make very beautiful bowls from a fine hard wood of the Country. The Cocoanut tree supplies them with excellent materials for forming good cords of every dimension; its fruit presents to them drinking cups, & musical instruments. They are also most expert swimmers, and pass a great part of their time in the water: they have a favourite aquatic amusement, which is very entertaining to behold. A man having a large flat board, about a foot & one half broad, & eight or ten in length, places himself on its surface, at some little distance from the shore, & awaiting a good opportunity, (his care being always to select the largest wave) laying himself along the board & using his hands as paddles, he rides securely to the beach, being propelled forwards by a wave, immediately before which, his care is to direct his surf board. In this manner by keeping the surf board end on, (as sailors say) they proceed thro' the water with astonishing celerity. I have been in a canoe when the natives paddling her have performed the same feat: the wave rolled foaming close on our stern, the natives taking care to keep their flying canoe exactly in a line with their precipitate pursuer: this experiment in a heavy surf, must be a nervous undertaking. From the 7th until the 12th we were beating up against a strong trade wind to Hido, all uncomfortable, & anxious to get rid.of our royal charge & suite. After having been laying about a month at the dangerous & exposed harbour of Woahoo, above two miles from the shore, & the passage without attention rendering boats liable to be swamped, (we had one boat upset,) from the heavy surf constantly rolling in, it may be imagined how delighted we all were, upon arriving at a spot so very different in every respect. Hido may most appropriately be termed the Valparaiso of the Sandwich Islands. The view from the ship, a panoramic drawing of which I have taken, is peculiarly striking. On all sides the most lively verdure prevails, luxuriant breadfruit trees flourish to the water's edge; these are thickly intermingled with towering cocoanut trees; amongst these are scattered the neat looking huts of the natives. In the distance the gigantic forms of Mowna Kaah, & Mowna Roa [Mauna Loa], rear their towering crests to the clouds; the summits of the former are continually veiled in snow, & the eye, wandering from the sunny landscape below, enjoys a fine contrast when resting on the bleak & snow capt peaks of the neighbouring mountains. One recreation here was particularly delightful, which was that of bathing in the fresh water stream before our door. I generally indulged myself in this refreshing exercise two or three times a day: the natives are constantly in the water, & it was at all times a curious and novel sight to see so many people of both sexes, constantly sporting about in this refreshing element, & exhibiting a variety of tricks. They were very fond of walking with their hands along the bottom of the river, showing only their feet & legs above the surface of the water. I have seen two or three dozen pairs of legs thus exhibited, making their way gradually across the stream. They are particularly expert in swimming, and delight in throwing themselves into the water from very great heights. About a mile & a half from our hut, situated on the opposite side of the bay, was a most beautiful waterfall, which, descending from a ledge of Lava rocks, emptied its contents into the sea. Nothing can be more romantically picturesque than the situation of this delightful spot: it proves a most excellent watering place for ships, whose boats are enabled to enter a small creek, & take in their water immediately below the falls. The entrance is rather wide & easily approached. On either side are high precipitate rocks whose brows are ornamented with cocoanut and breadfruit trees. The sides of these rocks are covered with beautiful creepers of all descriptions, abundantly bearing flowers of every hue & dye, & large elegant spreading leaves almost conceal the rock itself from your view. Having advanced about one hundred & fifty yards, you arrive at the first fall, beyond which the boats are unable to proceed. A few yards higher up is a grander & more important fall, descending from a ledge of black lava rocks. The scenery around is strikingly beautiful. In company with Lord Byron, I frequently of an afternoon took a paddle across the bay, in a small double canoe which was always at his command, in order to witness the aquatic sports of the natives, who were very fond of exhibiting their dexterity at this place. I have seen several plunge in above the fall, & allow themselves to be transported down by the roaring torrent which tumbled them over a precipitate ledge of rugged lava rocks, into a foaming abyss below. One would suppose when approaching this place, that they were incurring the risk of being dashed to pieces: the exercise however seems to afford them the greatest diversion. Overwhelmed by the whirling eddies they for a few moments entirely disappear then soon rise at some distance from the first fall, & are ready to encounter the second which however is inconsiderable when compared with the first. I have also seen some of the natives place themselves on the brow of a cliff, its height being about fifty feet, & with a running leap precipitate their persons into the fall below. These feats, both men and women and even children are fond of practising, & appear pleased at the astonishment excited in us at witnessing such daring adventures. H.M.S. Blonde leaves Honolulu on 12th July, returning to Hilo two days later. H.M.S. Blonde leaves Hilo, 18th July 1825, intending to visit Otaheite (Tahiti). Adverse winds prevent voyage to Tahiti, and the Blonde's next landfall is Malvern Island, named for the ship's surveyor. Starbucks Island, was sighted on1st August 1825. Our wind still proved adverse for Otaheite. On the 9th to our great surprise, land was again seen from the mast head, which upon our nearer approach, we supposed to be Watteoo [Atiu, Hervey Islands], a small inhabited island mentioned in Cook's voyages, as existing near the spot. We did not however feel at all assured in this opinion, as the latitude laid down by Cook, differed many miles from that of the island now before us. In the afternoon, we were within a few miles of the nearest point. A heavy swell rolled towards the land, which caused a tremendous surf upon a chain of coral, which appeared to encircle the island: beyond this it seemed thickly wooded. On the succeeding morning, we proceeded round a point, in order to get at the lee side, where we hoped to meet with some canoes. Shortly after breakfast, we perceived two or three canoes making towards us. We consequently lay to at about six miles distance from the land. One of the canoes in which was a single man, soon came alongside, & with very little persuasion, a rope having been handed to him, leapt on board. The costume of our visitor & of those in the other canoes approaching, soon put to flight our hopes of being the first discoverers, as likewise our fears of having our persons converted into steaks for the feasts of cannibals. Our friend had on a straw hat made precisely after the European form; he was clothed in a garment of Tapa, which however was differently worn from those at the Sandwich Islands. Whilst questioning our visitor, who spoke a language very much resembling the Sandwich tongue, another canoe came along side. The appearance of this canoe was quite novel to us. Unlike those of the Sandwich isles, altho double, it was formed towards the stern into one canoe. This stern, curiously carved, was carried up in an inward circular direction to about seven feet from the water. In this manner I believe are formed all the Society Island canoes. As these missionaries repeatedly assured us that we might land in safety, Lord Byron determined to go on shore: he kindly offered to give me a passage in his boat; he also took one of the missionaries with him, in order that he might show us the most convenient landing place. The other followed with some of our officers in the cutter. Upon approaching, the shore & being shewn the landing place, where were assembled a great number of natives, we began to be rather apprehensive for the safety of our boat, as a tremendous surf was then dashing upon the coral bank, upon which we were to effect our disembarkation. After some consideration, it was determined that we should remove into a large canoe which the natives had launched for our convenience. By seizing on the moment when the waves were precipitated with less violence on the beach, we were landed in perfect safety. Boats attempting to land here, & the sailors unacquainted with the propitious moment would inevitably be dashed to pieces. The Cutters crew followed our example. The coral bank which is constantly over-flowed, stretches about fifty yards distant from the shore, we were therefore all carried on the backs of the islanders to a dry spot. This friendly greeting now having taken place, we were led thro' a thick shady wood, supposing shortly to arrive at the huts of some of the inhabitants. At a large open space at the commencement of the wood, a very handsome canoe was building: it was chiseled out with very great care, & about 80 feet long, being thus rendered capable of visiting the neighbouring islands. Its form was precisely that of the one I before mentioned. We now all collected our different purchases and prepared for our departure on board. The surf had increased greatly since our landing, & our embarkation appeared fraught with danger: any mismanagement on the part of our native conductors would have exposed us to the greatest risk. Fortunately we got off to our boats in perfect safety, & having arrived on board about six o'clock made sail, & bade adieu to the hospitable regions of Mauti which we now denominated Parry's island. Our wind continued contrary until the 1st of September, when it suddenly became fair for the coast; we therefore gave up all hopes of seeing Otaheite, & forthwith made the best of our way for Valparaiso. Dampier describes the confusion experienced over the islands observed. Byron thought that the first island seen was Starbuck and, later, that Watteoo or Atiu in the Herveys was visited. Actually the Blonde stopped first at an island that proved to be a new discovery and was then named Malden by Byron. The ship then sailed by an island that proved to be Starbuck. Finally, she stopped at Mauti or Mauke in the Cook Islands (not Atiu in the Herveys) and then turned east to the coast of South America. Macrae, At the Sandwich Islands, pp. 74-75. Geoff Cater (2011) : Robert Dampier : Hawaii, 1825.